Happy Birthday, Grant and very nice seeing both puzzle styles come together for the finale. What other puzzle genre is hidden in here?Can someone post the spoiler ?I tried solving this as a Uvgbev and the puzzle breaks down no later than just a few steps. I saw the same clue but it took me a little while to believe that was the correct puzzle type because I’m used to it having ertvbaf orfvqrf ebjf naq pbyhzaf. Formally, this is more of a “Onggyrfgne”. I commented to Grant several times throughout the longer than usual puzzle approval process here that he was probably wrong to think many people would know that variation even if we have posted it once before. The puzzles work together in the final step. Thank you..Got it at the last! 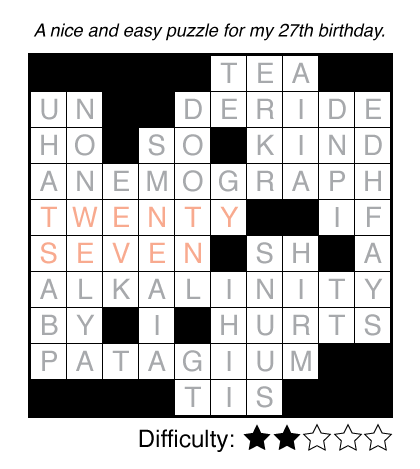 I love this site and all the different puzzle types, but I have no idea what is going on here. Could someone please tell me what are the rules? I don’t think I have ever seen anything like this before. Also, I realize that some commenters are using a replacement cipher. Is it a different key every time? I cannot figure out what some of you are saying. Sorry, I’m feeling very frustrated. Everyone uses a rot13 cipher here (take each letter to its inverse in the alphabet). I recommend you just copy the phrases to this site to get a few hints/spoilers. You don’t take each letter to its inverse; that’s atbash! I guess I’ve learned to view the alphabet as a circle because of years spent with secret decoder rings and cryptexes.